Suzanne is a 31..OK…34 year-old single woman living in a tiny apartment in New York City. Her job is as a technical writer for an air-conditioning company. With her biological clock ticking away, she has yet to find the perfect man. As she works mostly from home, her every day life is pretty predictable. However, she is determined to step up her search for a husband and decides to start by spending time on the apartment’s playground observing the mothers as they interact with their children on a daily basis. She slowly gets to know some of them which gets her introduced to several men and involved with a book group. A couple of the men she meets aren’t too bad, but neither are they the greatest. Suzanne has a mother who has driven her crazy all of her life resulting in her now amassing large fees from her shrink. Thank goodness her mother lives in Arizona. The story takes us through some of the dates Suzanne has with men and the resulting sexual encounters. In addition, she introduces readers to the characters in her apartment building that will leave the reader laughing. Life continues on this flat line way until Suzanne is diagnosed with a serious illness. What follows is an account of her reaction to her illness and her treatment. The novel has a number of laugh out loud moments. The biggest thing that struck me was that I could just hear Woody Allen telling this story. It was perfectly written for him to narrate it. 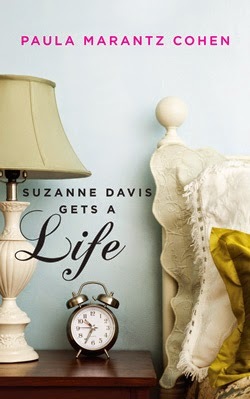 While I enjoyed some of the humorous moments and goofy characters in Suzanne Davis Gets a Life, I found that the book became a bit monotonous after awhile. However, I’m sure many readers will like the comedy. Thanks to Paul Dry Books for a print copy in exchange for an honest review. Connie Fischer is a retired office manager from NASA. Loved books from the time she could read. Spent childhood summers in her front yard tree reading Nancy Drew books and biographies. Loves historical and contemporary romance novels, chick lit and anything British. Is a reviewer for the blog, bookworm2bookworm. Her goal for 2014 on Goodreads is to read and review 100 books and she's way ahead of schedule. Lived in Paris, France for a number of years. Living now in southwest Florida. Ahhh...life is good!